Diary of a Psychic Healer: My Soul Purpose! I had a fantastic class today and left with a warm fuzzy feeling that took all of 2 hours to wear off. And to think that I almost skipped the session, lol. The purpose of today's meditation was to ask our guides about our Soul Purpose, i.e., what we're meant to accomplish in this life. We were also supposed to ask for very specific feedback on what we need to do to raise our consciousness to the next level. To start out, the meditation today answered a question that has been bothering me since I came back from the holidays in January. I've been living in London now for almost two years and just love the place. But because my family is back home in the US and Latin America, at times ask myself if I'm being stubborn when I tell myself I want to stay here. Well today when we were grounding, my 3rd eye opened up and I could see and feel myself in my London flat. It was almost like I was really there; I got up and walked around it, looked under the bed, in the kitchen, etc. I could see every last detail. Finally I sat down again, and saw myself grounding through my roots. I could also sense the street, my neighborhood, and I felt like I was very solid here. The next part was a bit freaky. There is a big wooden armoire in my bedroom and when the teacher instructed us to see a door that we would walk through; I found myself standing in front of this. 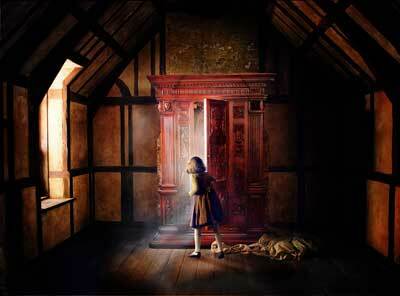 How very Narnia of me! I opened the door and walked through it, somehow I could get a sense of all my clothes and shoes and bags but it was like they were in another dimension and I was just walking right through them. I stepped into a long wooden corridor, went down steps made of the same oak as my armoire, and suddenly found myself walking through a huge tree's roots and out into a field. I took this to mean that it was time I rooted myself in my London life and surroundings, because I am in the right place. And the people and opportunities I have here will open doors for me and let me grow in ways I hadn't really thought of. On a sillier level, I know what portal to use if I ever manage to astral travel lol. The next bit I didn’t interpret during the session, the meaning is coming to me as I'm writing this. During most of the meditations we visualize an escalator that takes us up into the stars and to a Hall of Learning where we can meet our Guides, Angels and sometimes friends. This time, I was walking up the stairs but I couldn't see them under me. It was like I had to take steps into thin air, trusting that there was something there to hold me even though I couldn’t see it. I also had to do all the work myself, this wasn't an electric escalator. At the time it reminded me of one of the levels in Super Nintendo's Mario Bros (the little cloud steps that come onto the screen when you walk up them), but looking back on it there was so much more to that message. The angelic help we get is invisible, we have no way of proving that it's really there but if you take a leap of faith it will quite literally take you to new heights. From there, I finally made it to a really cute cottage. It was in the middle of a huge field and was pretty big even though on first glance it only looked like it had a few rooms. I had to walk through several corridors and living rooms to get to where my angels and guides were. There were people sitting on couches talking in the common areas, I got the impression that this was a meeting place for all of the people in my soul group. In one of the dining rooms I actually spotted a friend with his wife, it was funny because I wanted to say hi but felt like there was a force leading me up to the second floor where my guardian angel was waiting for me. When I walked into the room I immediately felt like it was full of love, compassion and divine light. My guides were in the background, but the glow from the angel was so dazzling that I couldn't keep my eyes away. I usually sense him like a massive energy behind me, but this time I could see him floating above the bed like he was sitting there waiting for me to come in. All along, our tutor was talking us through the meditation and she started reminding us why we were there. I tried to tune out her voice; it's hard to pay attention to your guides and angels when there is someone in the room talking. The funny thing is that at first I was really hanging on the instructions, but now the whole scene just unfolds in front of my "eyes" and I don't try to control the sequence of events. Even though the tutor was telling us to look out for our Guides, I let them take a back seat and turned to the angel instead. He was really cool about it, I asked him what I needed to do to raise my consciousness to the next level and his answer was very direct. It's my turn to be more compassionate, to pay attention to the people around me and to channel some of the healing energy and love into my surroundings. The idea made me feel warm and fuzzy all over, as soon as the angel started communicating I started feeling really light and airy. The colors purple and pink also flooded the room, which stand for universal love and spirituality. The feeling has just about worn off but I'm going to make an effort to tap into that consciousness in my day-to-day life.